An alliance of clean energy groups has opted not to wait for the Department of Energy to finish its 60-day study on baseload energy resources before weighing in on the research, which could influence energy markets all across the country. “We thought, 'Let’s not wait. Let’s file a -- we made up a word -- a pre-buttal,'” said Abby Ross Hopper, the CEO of Solar Energy Industries Association (SEIA), speaking yesterday at GTM’s Solar Summit. Energy Secretary Rick Perry requested the study in a memo on April 14, with his staff due to report back 60 days from April 19. The research is intended to “explore critical issues central to protecting the long-term reliability of the electric grid,” and to analyze "market-distorting effects of federal subsidies that boost one form of energy at the expense of others.” Perry wrote that the study will inform Trump administration policies. Language in the memo praises baseload power -- specifically coal, natural gas, nuclear and hydropower -- and criticizes the “erosion” of these resources, which raised concerns that the study would be against renewables like solar and wind. The focus on baseload energy, coupled with the short timeline, as well as Perry’s recent remarks that the federal government may need to “intervene” at the state level to support baseload energy in the name of national security, have only intensified the concern that the DOE report could have a predetermined outcome. Senator Chuck Grassley, a Republican from Iowa, laid out that precise concern in a letter to Secretary Perry this week, and requested more information on how the study is being conducted. Electricity sector stakeholders fear the department will advocate for policies that undermine renewable energy resources before consulting with industry experts and thoroughly reviewing existing research -- which shows that reliable grid management is achievable with a high degree of variable resources, and that wind and solar are not the primary drivers of the changing resource mix. On April 28, SEIA along with Advanced Energy Economy (AEE), American Council on Renewable Energy (ACORE) and the American Wind Energy Association (AWEA) collectively sent a letter to Secretary Perry requesting the DOE allow for public comment on the report. The letter noted that it is “customary” for agencies developing reports that provide policy recommendations to allow stakeholders to submit comments on a draft, prior to the report being finalized. The DOE has not sent a reply. And so this week, the alliance of clean energy organizations each submitted materials to the DOE on their own accord, hoping to inform the energy markets study. “The question that’s being asked is a fair one,” said Hopper, but the answers already exist. “There are a large number of studies that have looked at this very question, many of them done by the DOE, and many of them done by the national labs,” she said. Update: DOE spokeswoman Shaylyn Hynes responded to Axios regarding the study on May 5. "The findings will be released to the public (including stakeholders) once the study is completed this summer," she said. "The Secretary looks forward to receiving input from all parties once that occurs." Here are three major takeaways from the SEIA, AEE, AWEA and ACORE reports. It is true that wind and solar benefit from certain beneficial policies -- specifically, the Production Tax Credit for wind and the Investment Tax Credit for solar at the federal level, as well as renewable energy mandates at the state level. These measures have helped the renewables sector grow, but clean energy groups insisted that regulatory burdens, mandates, tax and subsidy policies are not responsible for forcing the premature retirement of baseload conventional power plants. First of all, the incentives for renewables are relatively small. Wind and solar energy account for less than 5 percent of total federal cumulative energy incentives, while nuclear and fossil fuels account for more than 85 percent of cumulative energy incentives, according to ACORE, which cited research by the U.S. Treasury, the Joint Committee on Taxation, the DOE, DBL Investors and others. The ACORE brief also noted that only four major energy tax preferences are permanent: three are for fossil fuels and one is for nuclear energy, according to a 2012 Congressional Budget Office report. Renewables do not have this benefit. Federal tax credits for wind and solar are already scheduled to sunset over the next four years. It’s worth noting that baseload energy groups (like the nuclear industry) have still argued that they’re at a policy disadvantage. And there is a legitimate debate taking place in the electricity sector on how state-level policies interact with regional wholesale markets. The point clean energy groups are making is that renewable energy isn’t the only type of energy resource to benefit from favorable policies. Market dynamics may be changing, but it’s not because of renewable energy subsidies on their own. Furthermore, renewables are becoming cost-competitive without subsidies. 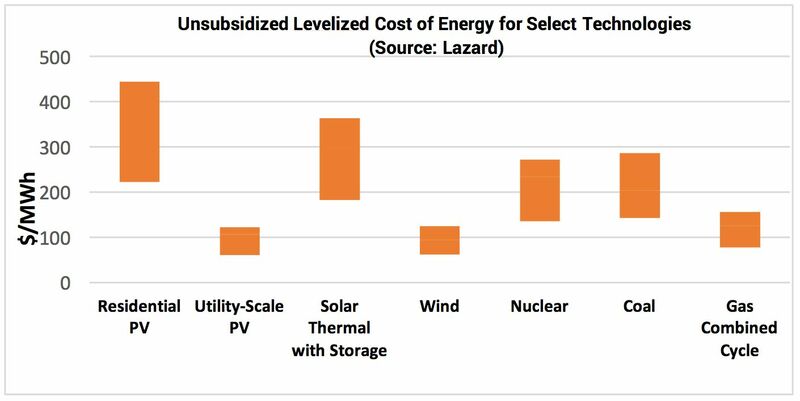 According to Lazard’s annual analysis, the unsubsidized levelized cost of energy for utility-scale wind and solar power declined by 64 percent and 81 percent, respectively, from 2008 to 2015. SEIA pointed out that the unsubsidized levelized cost of utility-scale solar now ranges from $46 to $92 per megawatt-hour, which is on par with wholesale electricity from new wind and natural gas plants. Residential solar, which competes against retail electricity prices, is now also competitive in most markets. 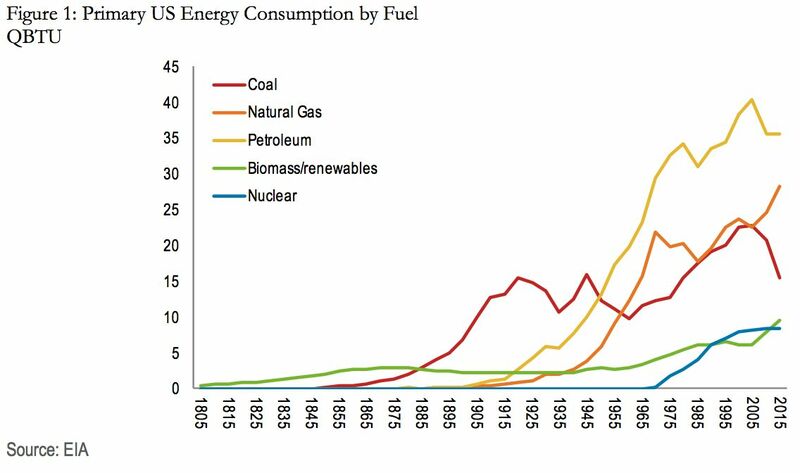 While solar and wind have started to become more competitive with traditional energy resources in recent years, the abundance domestic shale gas has been the primary driver of the changing energy mix. 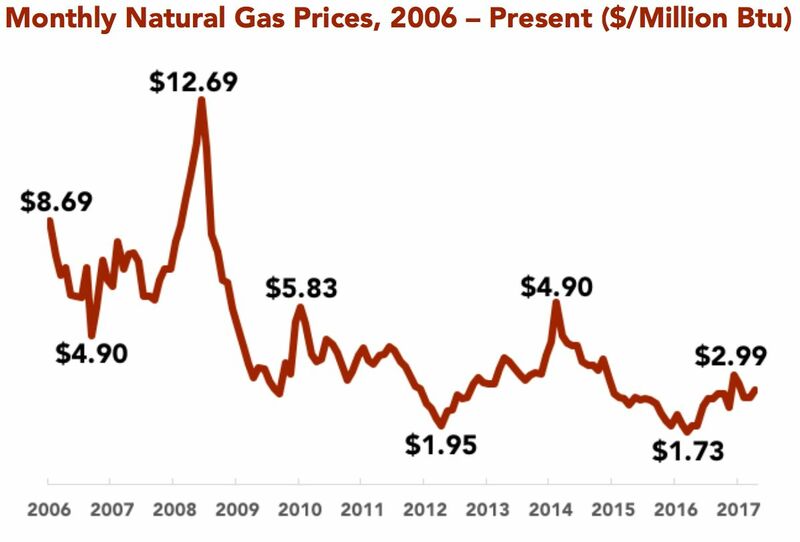 Natural-gas prices have fallen from an average price of $8.86 per million BTU in 2005 (with a spike above $12 per million BTU in 2008) to an average of $3.20 per million BTU for the last five years. Low natural-gas prices are encouraging grid operators to dispatch this capacity at increasing rates, to where it now has the largest market share of all the generating technologies. Also, natural gas often sets the clearing price of electricity in wholesale power markets. For example, in the Midcontinent Independent System Operator (MISO), natural gas set the price of electricity in the market 75 percent of the time, while coal set the price 23 percent of the time and wind only 1 percent of the time. The Energy Information Administration’s numbers show that coal use in the U.S. declined sharply as natural gas use spiked. 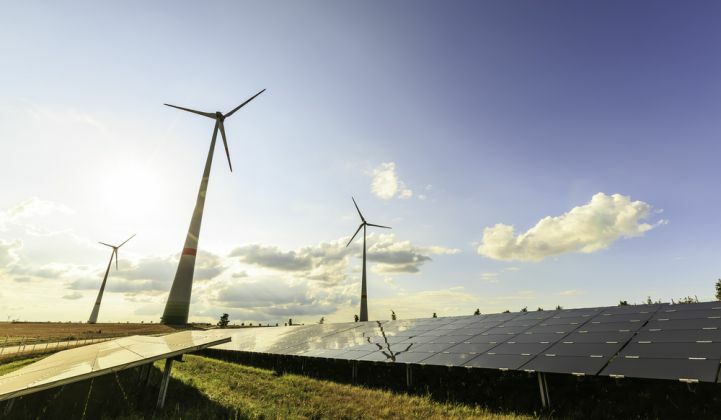 Renewable energy stakeholders also pointed out that the U.S. electric grid are not only capable of handling current levels of wind and solar penetration, but that the grid actually becomes more resilient because of these resources. In the materials AWEA submitted to the DOE this week, the group highlighted that high penetrations of wind generation have maintained or improved electric reliability on the grids where they’re located. Texas’ ERCOT territory, for instance, which has the most wind capacity of any U.S. power system, has seen its electricity reliability increase while adding large amounts of wind. 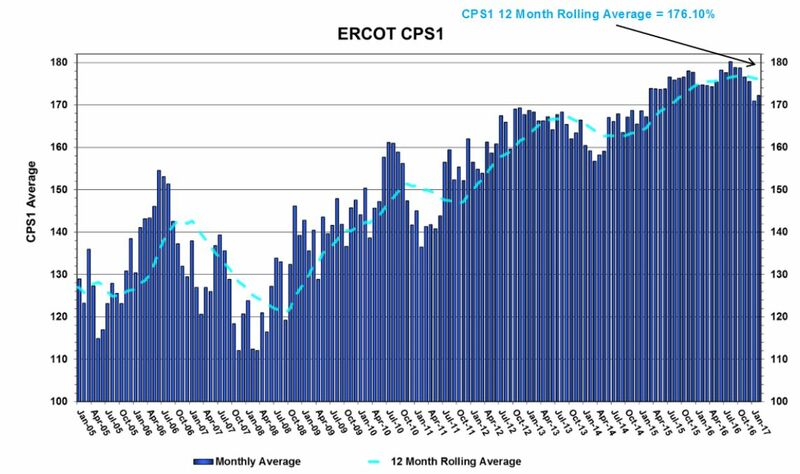 The market’s CPS1 score (a widely used reliability metric that measures how electricity supply and demand are kept in balance) has improved as wind deployments have increased. On a related note, researchers at the University of Texas at Austin have shown that the growth of wind energy in ERCOT territory has not caused a significant increase in the need for the frequency regulation reserves that are used to keep electricity supply and demand in balance. The DOE has also studied the reliability issue, as Senator Grassley indicated. In 2012, government researchers found that 25 percent to 50 percent renewable energy penetration did not trigger any concerns on any reliability metric, and that renewables could go as high as 80 percent penetration with existing technology. It may well be time to update this study, as Secretary Perry has requested. Renewable energy stakeholders just want to ensure the DOE is taking all relevant data into account.